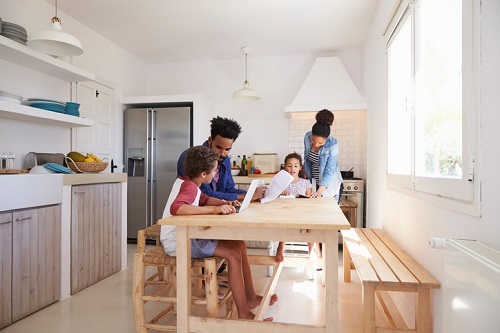 Many Latinos feel that the idea of the American Dream, including financial security and homeownership, could be disappearing, according to the State of the American Family Study released by Massachusetts Mutual Life Insurance. The study found that the majority of Latinos carry some type of debt. Sixty-three percent of Latinos have a mortgage, with an average debt of $181,292. According to the study, many families are worried about paying down debt given their desire to play an active role in preparing children for future success. More than a third of Latinos (38%) believe the American Dream is disappearing. Interestingly, the study found that 75% of those who selected homeownership as part of their American Dream are confident that they will one day own a home if they do not already. However, they still worry about meeting long-term goals as they prioritize short-term needs such as building an emergency fund and ensuring stable family income if the unexpected happens. The financial challenges faced by Latinos may partly explain their expectations of achieving the American Dream. Latinos have the lowest household income of all segments surveyed and are among the least prepared for a financial emergency. They also have relatively lower accumulated wealth given an average household income of $107,801. Additionally, the study found that 24% of Latinos worry about being able to care for their parents as well as their own nuclear family as Latino households are more likely to have a broader definition of family that includes extended family. "With strong family and cultural values, Latino families are juggling multiple financial priorities, such as a future caregiver role for elderly parents," said David Hufnagel, Latino market director at MassMutual.